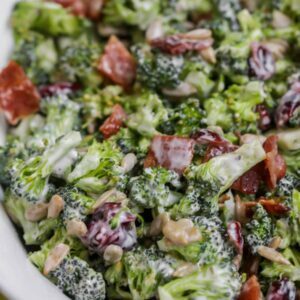 This Sunny Broccoli Salad is a simple, tasty and hearty broccoli salad served with bacon, cranberries, sunflower seeds, and mixed with a delicious, homemade mayonnaise-vinegar based dressing that is perfect for BBQs and get togethers. In a large bowl combine mayonnaise, craisins, sugar, and vinegar. Add broccoli and stir to coat. Cover and chill in the refrigerator for at least 2 hours or up to 24 hours. Before serving, stir in sunflower seeds and bacon. ENJOY!